This was such a lovely & relaxing experience! I adore the art style & the music is wonderful as well. I'll definitely be checking out the full version, nice work! Thanks so much Atlas! It's been done since damn near April but our publisher is trying to get it somewhere cool like Humble monthly or something, super fingers crossed. But at this point, we're ready to call it and just release on steam + itch. Should be this summer! Thanks for playing!!! Glad you enjoyed! 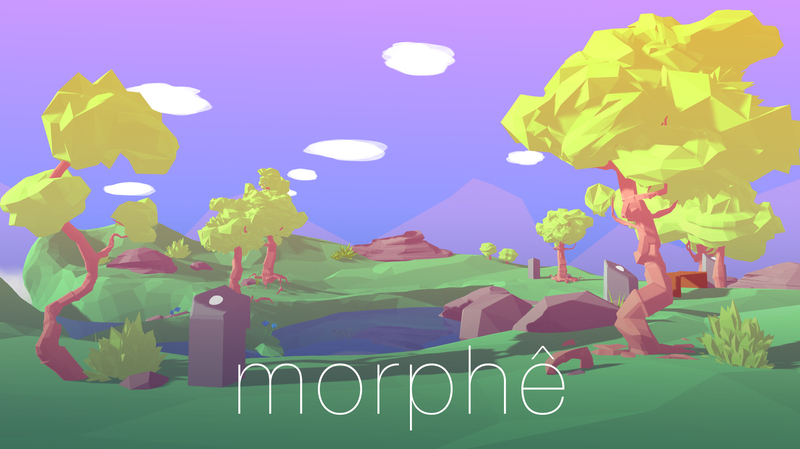 We're actually in the process of making a complete version of morphe for VR and Steam, so around Xmas keep an eye out! Thanks so much for playing!!! So glad you liked it!!! Hey! We've heard the request before, and said we would....should be up in a few. Though, it's 100% untested on our end. We'd appreciate some feedback if possible! Thanks a lot for the build! Works fine of my end. A general feedback I would have is that mouse sensitivity is a bit high, but this might just be a general thing. Very relaxing game with beautiful colors- loved the little ladybugs. Thanks for playing! Great to hear that it runs. Cheers! This is up for download - we'd appreciate you letting us know if there's problems! Really, really lovely and relaxing game! Enjoying it a lot, and can definitely see myself coming back to it when I'm feeling stressed - even just letting it run in the background. Was just a thought I had anyway. Thanks so much for making this, it's really beautiful! Thanks for playing!!! Yeah that was definitely what we intended, but didn't get around to it. Maybe we'll update it sometime after we get the VR version out! Thanks a ton Luuwa, so glad you enjoyed it. Really enjoyed this! I love how many different options there are for sound effects/music. It was so relaxing, I killed like an hour on it. I also made a let's play, hope you don't mind. Thanks so much for sharing! Really glad you liked it!!! Will watch the Let's Play in a bit - this reminds us that we should put up one of those notices that people are free to stream/do what they want w/our games. Will do soon! I just played this, and really liked it! I was in a long stint of indie horror games and was looking for something to chill out, and this did a wonderful job! I made you a nice Lumps Play, check me out for pop-up riffing & commentary good times. Cheers, and thanks for making this! Would you be interested in setting up a version of this project file with the SteamVR plugin, and some basic input / movement? I'm working on my first game, a small 3D arcade runner, but before setting that scope I was playing around with VR and it's quite easy to implement. Thanks for the feedback, glad you enjoyed. We're currently redoing the game for GearVR (and now probably Daydream + others), and after your comment we've got SteamVR on the table too. We don't currently have a viable headset for testing, but can possibly get a hold of one. If we start active dev, we'll let you know - if you'd be interested in helping playtest, that'd be great! I absolutely love this game! Glad to see games similar to Proteus starting to peek out their heads. Had such a lovely time visiting this island- a real feast for the senses. Good job team, looking forward to your future work! Thanks a ton for playing Ed!! This was freaking beautiful. Thank you so much for making this!! It's really relaxing. Thanks so much for playing, great video!! So glad you enjoyed! We usually work in Unity3D, highly recommend it if you're interested in getting into making games. This game is really cool. Not only are the graphics nice to look at, the concept of this game is interesting. I love music, especially chillstep and calm style stuff. And this game not only has that, but allows the player to create their own in a manner of speaking. The world itself is cool plus when you are listening to a song you have created. The game does something I wasn't expecting. It's as if the world itself melts away so you can simply listen to what you have created through the different obelisks. All in all, a unique and creative game that allows you to make your own style of music with what is provided and I loom forward to seeing if the developer comes up with another like this. I did a video on my experience with the game if anyone is interested. Really cool! I have a bit of a suggestion, though. It would be cool if you could hear walking sound effects depending on where you're walking. Like if you're walking on grass, you hear a sound effect that sounds like walking on grass. Or if you're walking on water, you hear water sound effects! Ahhh good point! Honestly, we did plan on a number of features (the water was going to be a place you could jump into and affect the music) that didn't make the "free game" cut. One thought we had re: walking SFX is that it sort of interrupts the music - hence why there's no notification SFX when you activate stuff. At one point we were playing the game and playing instruments along with it, so any extra noises weren't great when recording. We just hit 2,000 downloads though and were planning on doing an update, so we'll put the walking sfx in there as well! It would be really cool if the game could somehow write a music file to your computer so you could save the music you make. Hi! What about Linux version? It took forever but there's a Linux build up now. Let us know how it plays, it's not very tested! I tested the game on a good PC, but i think the performance is slow... you can try the Occlusion Culling tool in Unity, it works fantastic well. Hello, thanks for getting in touch! We'll take a look at this tonight - I'm sure we'll be able to get performance up (didn't really focus much on it honestly). We'll let you know once the fixed version is up! Hello - we've just pushed a new version that should be more performant. Let us know if you notice a difference at all! Great! Yeah we did most dev on a 2009 iMac and at full res it wasn't doing well before the fix, now doing fine. Glad it worked, and thanks for the feedback! Hello :) I tested your game and found the concept very cool (also the environment is beautiful), but in practice I didn't stay longer than a few minutes. Maybe an interface differentiating more the several sounds on the obelisks could be more enjoyable, and it would be nice to see how it's influencing the environment (like changing the colors or other). Maybe more basses? Also, I encountered a bug, when you quit too fast an obelisk, the interface stay on the screen. Wish you a good continuation, I'll stay informed. Thanks for the feedback - what you mentioned fits perfectly with feedback others have given, and is actually already partially fixed up! We should have a final build out before the end of the month that addresses a lot of those issues. Thanks again for playing! I feel similarly about the game. It's neat at first but I think it needs more options to stay engaging. Thanks a ton for the video! The radio currently only toggles on and off, with some abstract talking - the final version (due in a few weeks) will have a full interface for the radio with stations and lots of variety.